Fairly easy with some moderate terrain, rocky in areas with some climbing. 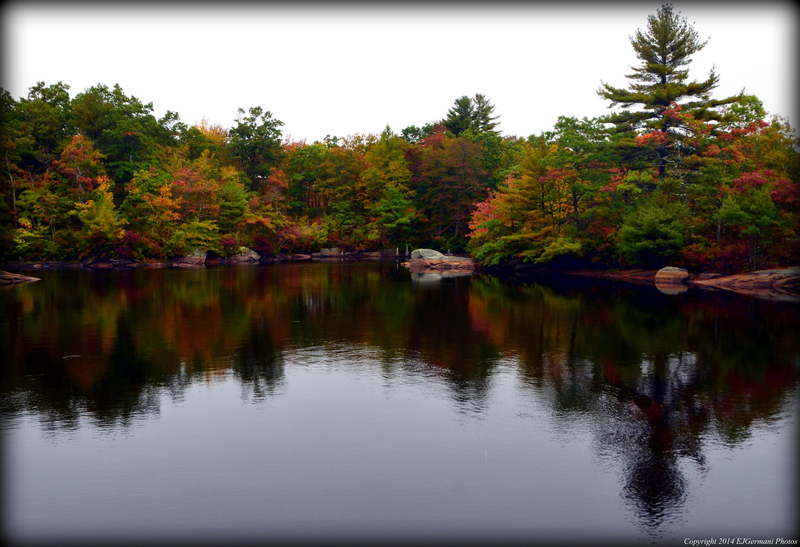 The beautiful property, just north of Camp Yawgoog, is nearly pristine. The property is privately owned by the Rhode Island Boy Scouts, but the trails are open to the public. There is signage at the parking area that depicts this. For this hike, a loop, I parked at a small parking area with a sign for Hidden Lake. I decided to eliminate the small road section of the hike first which resulted in me doing this loop in a clockwise direction. This would also save the lake views for the end of the hike. From the parking area I followed Camp Yawgoog Road west about 1/5 of a mile following the yellow blazes along the road. Soon, I found the yellow and blue blazes indicating the turn to the right. This trail is in fact the southern end of the Tippecansett Trail, as well as a portion of the Narragansett Trail. The trail is narrow but very well maintained. 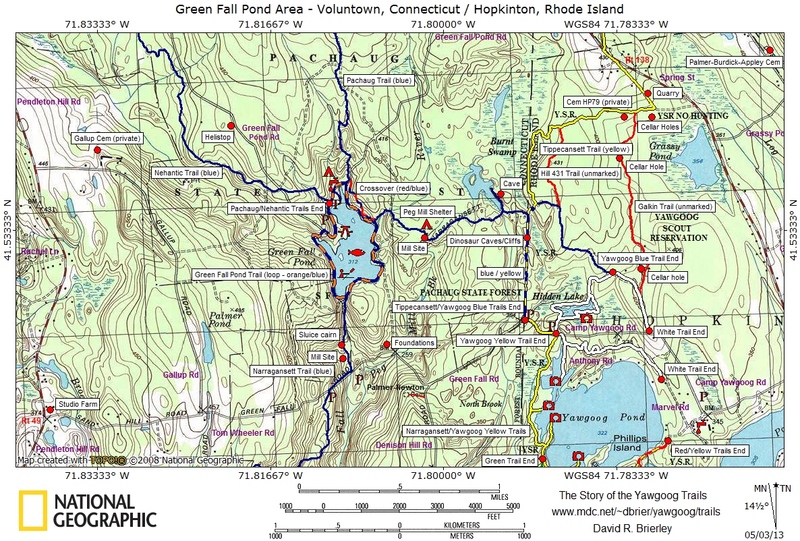 It meanders through boardwalks, outcrops, and through root bound areas as it straddles the Connecticut/Rhode Island border, continuously crossing back and forth into each state. I soon approached an area of large outcrops, boulders, and ledges. The trail seems to go downhill and around the towering ledge. The blazes, however, have you going over the outcrop. Following the blazes, I made my way to the top of the outcrop. This area is known as Dinosaur Caves. I then continued along the trail, eventually coming to a split. The trail to the left is the blue blazed Narragansett Trail, heading west into Connecticut towards Green Fall Pond. The trail to the right is yellow and blue blazed. There is a sign here indicating that it is the Tippecansett Trail. I turned right here and climbed down the very rocky trail. The trail soon comes to another large outcrop and the trail blazes split here. The yellow blazes of the Tippecansett Trail head to the left and the blue blazes continue straight. Along with the trail I had been following, the remainder of the blue blazed trail ahead of me is part of the Yawgoog Trail. After continuing on the blue blazed trail for a bit, I came to an intersection. The blue blazed trail turns right here. The trail to the left is the unmarked “Hill 431 Trail”. I turned right. This section of the hike is quite level and easy as it gently traverses downhill over a long stretch. This trail ends at the next intersection, where I turned right onto the white blazed trail that would lead me to Hidden Lake. This area becomes hilly again and the trail eventually splits at another outcrop. The option is yours on which way to go. The two trails join again on the other side of the lake. I choose to turn left going down another steep hill. The trail winds up and downs small hills before coming to a picnic area. Here there is a small rock peninsula that juts out into the lake. After spending a moment taking a few photographs and observing the ducks I continued along the white trail. The trail crosses over a spillway before joining the “other white trail”. Turning left here, I soon found myself back at the car. Trail map can be found at: Hidden Lake.